As Europe lurched towards war during the 1930s, many people in Britain, with the memories of the horrors of the First World War painfully fresh, set out to build groups opposed to the idea of a future war. As Europe lurched towards war during the 1930s, many people in Britain, with the memories of the horrors of the First World War painfully fresh, set out to build groups opposed to the idea of a future war. Despite current notions of the Second World War as being a time when Britons pulled together with a unity of purpose, many of these organizations continued their work in either campaigning against the conduct of the war, or to alleviate its more destructive effects. The people who went against the political and cultural climate of the time have been somewhat airbrushed from history. This book brings them back into focus and demonstrates the myriad ways in which they lived out the slogan ‘I Renounce War’. After graduating in History from the University of Sheffield in the early 1990s, John Broom pursued a career in teaching, firstly in his chosen subject and latterly with children with Autism. 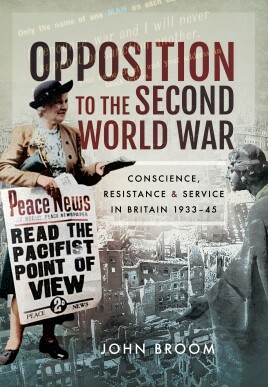 A chance inheritance of family papers eleven years ago prompted his interest in the spiritual and ethical issues of the twentieth-century world wars.John has been awarded a PhD on Christianity in the British Armed Services by the University of Durham, and is the author of four published books: _Opposition to the Second World War_ (Pen & Sword, 2018); _A History of Cigarette and Trade Cards_ (Pen & Sword, 2018); _Fight the Good Fight: Voices of Faith from the Second World War_ (Pen & Sword, 2016); _Fight the Good Fight: Voices of Faith from the First World War_ (Pen & Sword, 2015).